Did you know heat, activity, and stress can all cause you to sweat, and that stress sweat smells worse than other kinds of sweat? 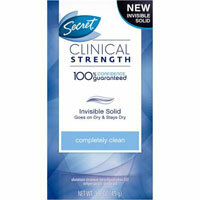 Secret Clinical Strength gives you 4X protection from stress sweat. It absorbs odor while releasing scent, to keep you smelling clean and feeling dry.